In 1996 the Posillipo shipyard was on the crest of growth. 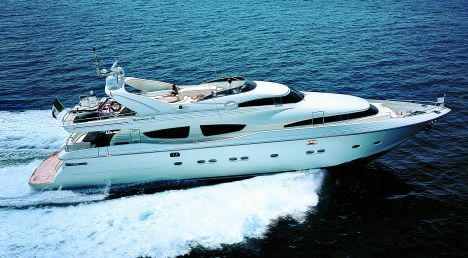 Its phase of rebirth, brought about by Gianfranco Rizzardi's managerial and technical skills, culminated precisely that year with the launching of a new flagship designed by Giovanni Zuccon: the Technema 80. Last summer the thirtieth example of this boat was launched, underlining just how much its longevity has been backed up by constant success, indubitably a result of the technical qualities of the hull but also of its actual design. 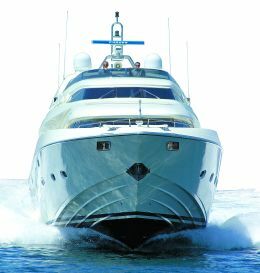 From that base, from that success - having brought out the current flagship a couple of years ago, the larger Technema 105 - Rizzardi decided to build another big boat, the Technema 95, entrusting the design of its layouts to Carlo Galeazzi, an architect who has demonstrated his skill with several successful vessels on the market. The task might have been tough, but all the conditions for a good result were there, and that's how it turned out: the Technema 95 was also appreciated immediately. We need only note that even before the launching of the first one in late spring the yard had declared the sale of no less than six custom vessels. In recent months the figure rose to 10 - three of them already afloat - which practically accounts for two years of production. So Galeazzi did a fine job, offering an elegant, well-balanced boat with harmonious modern lines which, without excesses, recall the yard's style. "The Posillipo brand," Galeazzi told us, "today owned by the Rizzardi group, has a history, a great past which could not be set aside. That was the starting point for tackling this demanding project. 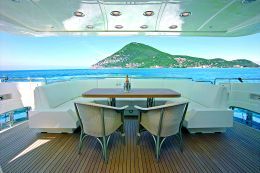 Making the decidedly considerable volumes of a two and a half deck motoryacht sleek and aggressive wasn't an easy task, what with its raised internal bridge zone. Modern reinterpretation of the family features led to the proposal of an elegant and refined image which has enjoyed great success. In the details the external lines consist of a mixture of curved surfaces and sharp corners that compose complex volumetric elements in an intentional combination of modernity and classicism". As for the décor, it is left to the owner to choose an architect for the highest level of customisation. The first three boats produced, for example, bore the signatures of two different specialists: the first was by Reberberi and the others by Carlo Trezzi. 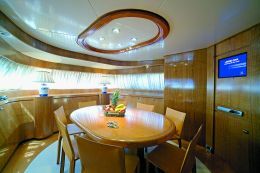 As with all top range superyachts the owner can adapt the vessel to his tastes in the choice of woods and materials: cherry, maple or satined oak, marble, broadloom, fabrics and bathroom fixtures. For the bathroom floors you can choose practical teak or go for marble, while the most demanding customers may opt for mosaics, another decidedly exclusive alternative which, obviously, does not come under standard accessories. Both hull and deck superstructures are in GRP. 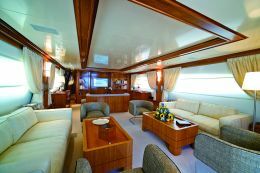 Externally the living areas are notable for their size and comfort: the flying bridge features roomy semicircular sofas and comfortable sundecks, so guests can enjoy open air life to the full. The large bar on the upper deck is equipped with sink, fridge and icemaker. 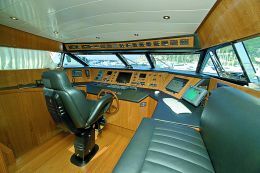 The layout aft includes accommodation for two jet skis or a large tender, while the command bridge is situated forward, protected by an efficient windshield. The cockpit provides ample space for a sofa plus a fibreglass table and chairs. The interior envisages different solutions with compartmentalisation in 4 or 5 cabins. The large saloon is on the upper deck, with the dining area and a table to seat 10, plus a separate zone which can be used as an office or a playroom; and then, of course, the decidedly technological and fully equipped bridge. 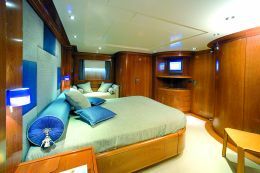 The night zone for the 4 cabin version has an owner's suite with dressing room and spacious bathroom with Jacuzzi or, on request, a hydro-massage shower. 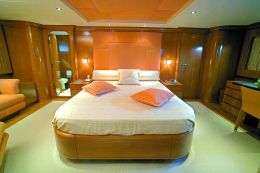 Still on the lower deck there is a VIP cabin and 2 double guest cabins, each with private bathroom. 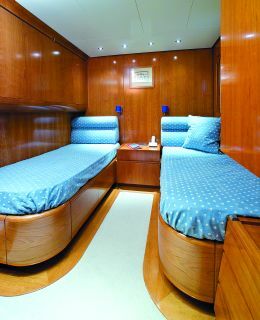 The crew's night zone is forward and consists of 2 cabins for four persons, with separate bathrooms. The 5 cabin version envisages two solutions with different compartmentalisation: the first one has the owner's suite on the upper deck while the pantry area is extended thus leaving more space for the crew's quarters; in the second version all the cabins are on the lower deck. The Technema 95 is also rich in instrumentation, both on the internal and flying bridges, with state of the art autopilot, radar, plotter, etc.. 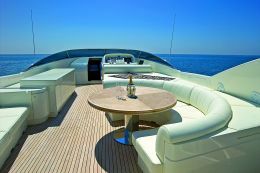 The standard accessories too are high level with hot/cold air-conditioning in all the rooms and plasma TV in the saloon and cabins. In the saloon an electrically controlled mechanised system slides away a large painting to reveal a flat TV screen set flush to the wall.